IT was very hot day. A crocodile was lying on the ground. He wanted to go to the river and enjoyed the water. However, he was too weak to go there. He was waiting for an animal to help him. His wish came true. A buffalo was passing by. He asked the buffalo to helped him. "I want to go to the river. But I am too weak. May I jump on your back and take me to the river?" asked the crocodile. "Certainly, Mr Crocodile. I'm glad to help you," said the Buffalo. Soon the crocodile was on top of the buffalo's back. And when they arrived at the river side, the buffalo asked the crocodile to get off. "Not now, there is not much water here. Please go farther," said the crocodile. The buffalo continued walking. They were almost at the middle of the river. The water was on the neck of the buffalo. The crocodile get off from the buffalo's back. Instead of saying thank you, the crocodile bit the buffalo's leg. "Hey what are you doing?" asked the buffalo. "I'm so hungry. You have to be my lunch!" said the crocodile. "But it is not fair! I already helped you!" "I don't care!" said the crocodile. A mouse deer saw their argument. He was standing at the river side. He wanted to know what happened. "Hey, what are you arguing about?" asked the mouse deer. "I already helped Mr. Crocodile, but now he wants to eat me." 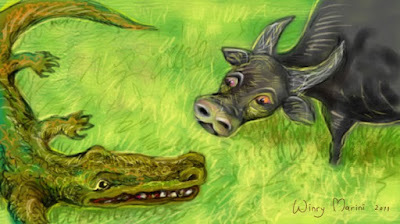 The mouse deer knew that the crocodile was a mean animal. He wanted to help the buffalo. "What? I cannot hear you. Both of you are too far from me. Come closer to the ground. Slowly, the buffalo moved his body. The crocodile was still biting his leg. And when they were on the ground, the mouse deer whispered to the buffalo's ear. "Kick the crocodile now and run. The crocodile cannot move fast to the ground." The buffalo immediately kicked the crocodile with his other leg. The crocodile was in pain. He opened his mouth. The buffalo was free. Soon the buffalo and the mouse deer ran fast to save their lives. "Wait for my revenge mouse deer. I will eat you alive!" the crocodile was angry. Several days later, the crocodile met the mouse deer. "Aha! I will eat you now!" "No, wait! Do you know what I'm doing here?" asked the mouse deer. He continued, "Do you see that big and shining rope over there? Well, it's not a rope. It's a magic belt. The god of the jungle asked me to guard it." "Really? What kind of magic does this belt have?" asked the crocodile. "Anyone who wears the belt will have great power," explained the mouse deer. The crocodile wanted to have great power. However, he did not know that the belt was actually a big snake. And the snake was sleeping. The crocodile asked the mouse deer to go away. And when the mouse deer left. The crocodile lifted the belt and put it around his body. Belum ada komentar untuk "The Stupid Crocodile"